Please take this blog as non-pro and also take it as an ordinary post from an ordinary hunter like us. Basically giving our own opinion from the latest update here. CES 2019 SteemHunt event was a success, of course it is. We had an amazing week since the CES 2019 began, the posting guidlines section 2 do not apply to CES2019 products. Which could also be a problem since there are a lot of products to be posted in one day, and if I were them, I would be posting earlier before 12AM KST to prevent Duplication. I was wondering, how many products were posted during CES2019 event? 200 innovative products from CES 2019, which led to a 13.3% increase in DAU (daily active user) and a 33.7% increase in impressions on our Twitter account. Awesome! We have over 200 CES2019 products, and the traffic is also high at that time. I guess we should be active more in twitter to gain some more audiences right? I have to be honest with you, I never thought the question would be about selling hunt tokens thats why my bullet answer is “0.10”. Where instead I want to buy hunt tokens in an amount of 0.01 USD. Now, is my survey still valid without reading the questions properly? 78% are interested in buying HUNT tokens in our sales event, and 7.2% said their budget would be over $1,000. This is pretty interesting, with 78% wants to buy it same as me, and wait – 7.2% would be over 1k USD, does this mean – many will buy more tokens at the price of $5000 or so? $0.0489 is the average desired price to purchase. Their favorite trade pairs are BTC, ETH, USDT, and EOS in order. I was expecting USDT to be the first one, ETH to be the second one. If you are watching their github repo and reading it with a little bit of knowledge from your programming skills, I believe that withdrawals will be daily and would have a daily constant token limit. I dont know why they put up with this, maybe because they dont want to see users dumping the token, who knows – I dont even know how SMT wallets works, does this have the same functions from an ERC20 wallet (ETH). Lets just wait and see. Thanks to @aamirijaz for letting me now about this. The subject of SMT release would be this May. 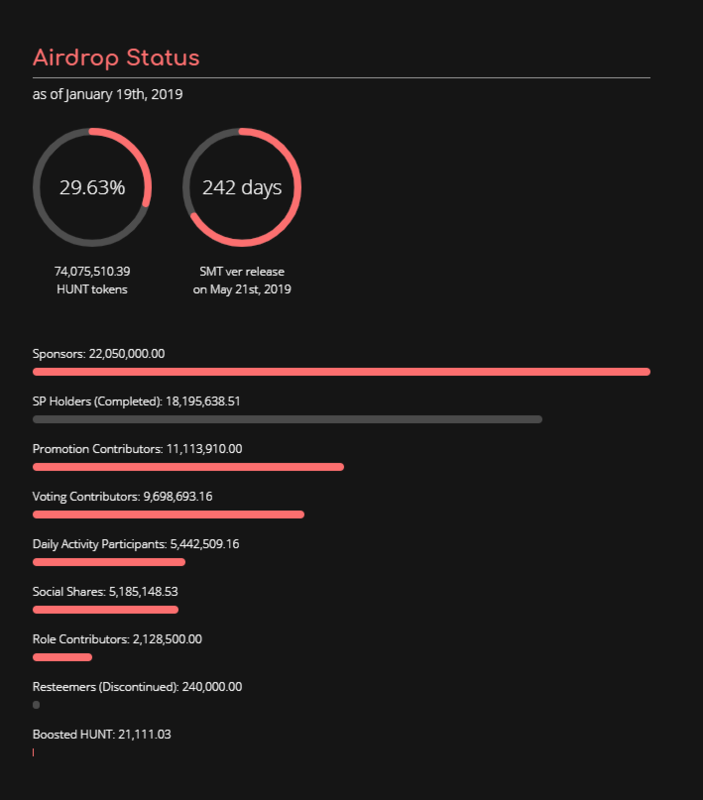 That is also after the release of ReviewHunt, the days are going so so fast, but a question popped out of my mind – will the team rain a few tokens since it could be possible to airdrop only less than 150million tokens, NOT 250Million, could it be the other tokens will be for ReviewHunters? That sounds interesting. 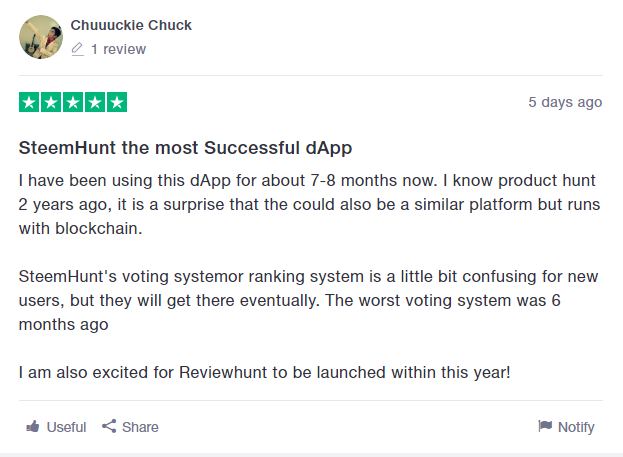 Fellow hunters and big stakeholders, its time for you to help SteemHunt to get some honest review, but – please dont be bias you may vote 1-5 stars choose between those numbers and bring a meaningful review comment. Ive been around in SteemHunt for a while now. I am also one of slightly big tokenholder among valuable co-influencers and hunters. Influencing products was not the problem at the first place, maybe some people do get eventually tired and just pass it by, in a decentralized community is there such thing as retirement? Lets discuss.